Scleractinia, stony corals in the Somo Somo Strait, Fiji. Aiptasia, Glass, Rock Anemones & General FAQs, Aiptasia Identification, Eradication by: Peppermint Shrimp, Butterflyfishes, Filefishes, Chemical Injection, Hypo/Hyper-Salinity, Other Pest Anemones. Borneman, Eric H. 2001. 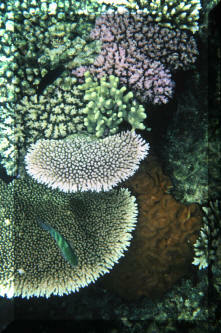 Aquarium Corals; Selection, Husbandry and Natural History. Microcosm-TFH NJ, USA. 464 pp. Fossa, Svein A. & Alf Jacob Nilsen. 1998 (1st ed.). The Modern Coral Reef Aquarium, v.2 (Cnidarians). Bergit Schmettkamp Verlag, Bornheim, Germany. 479pp. Hoover, John. 1998. Hawai'i's Sea Creatures. A Guide to Hawai'i's Marine Invertebrates. Mutual Publishing, Honolulu HI. 366pp. Humann, Paul. 1993. Reef Coral Identification; Florida, Caribbean, Bahamas. New World Publications, Inc. Jacksonville, FL. 239pp. Veron, J.E.N. 1986. Corals of Australia and the Indo-Pacific. U. of HI press, Honolulu. 644 pp.